Double Olympic champion Laura Trott fought back to win the individual pursuit title on day one of the British Track Championships in Manchester. Trott, 23, trailed Scotland's Katie Archibald by almost a second at halfway before crossing the line 0.3secs ahead. 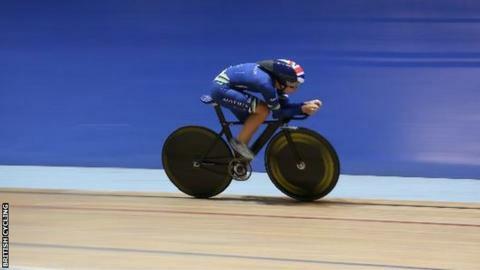 Andy Tennant, riding for Sir Bradley Wiggins' team, retained his men's individual pursuit title. Matt Crampton and Katy Marchant won maiden titles in the men's keirin and women's individual sprint respectively. Double world champion Sophie Thornhill, 19, piloted by Helen Scott, retained the mixed Para-cycling BVI standing start time trial. Leeds sprinter Kadeena Cox, 23, won the Para-cycling C1-5 mixed time trial. Defending champion Archibald qualified for the women's individual pursuit final over a second ahead of Matrix Fitness rider Trott and looked set for victory after a strong opening half to the race, but Trott showed tremendous stamina to win in a time of three minutes 32.759 seconds, with Archibald crossing the line in 3:33.065. Trott told the British Cycling website: "I didn't really know how well I was going to go. I was really happy with my time and to take the national title. "I just went flat out so I was really happy that I managed to pull it back and in typical Laura form, leaving it until the last two laps." London rider Germain Burton, 20, had a slight lead at the halfway stage of the men's event, but Tennant, 28, turned it around to lead by a second with 1km remaining and powered to victory clocking 4:23.583 with Burton finishing in 4:27.209. Tennant said: "It's fantastic. There was more pressure this year as the reigning champion, pressure that I'd put on myself more than anything." Marchant, 22, who ended Jess Varnish's two-year reign as sprint champion earlier in the day, was pushed hard by Becky James but won the opening two races in the best of three to earn the individual sprint title. "I was really happy with qualifying and my legs were on my side and I felt really strong and I felt like I did myself justice," said Marchant. Welsh cyclist James, 23, who had an operation to remove abnormal cells following a cervical screening in May 2014, only made her comeback in the Revolution Series in Derby in August. In the final event of day one, Matt Crampton, 29, won a thrilling men's keirin with Lewis Oliva claiming silver and bronze going to Thomas Rotherham. Three-time Olympic champion Jason Kenny had to settle for fourth. "I've had a tough year, a tough couple of years so it's really nice to step up today and put a bit of icing on top of the cake," said Crampton. Tour de France winner and four-time Olympic gold medallist Wiggins pulled out of the Championships on medical advice after suffering with a cold following the recent Tour of Britain. Saturday's events include the finals of the men's sprints and kilometre time trial, and the women's keirin and scratch race. The championships conclude on Sunday.